Amy Rawlings is an experienced, professional Hair Stylist in Worthing West Sussex, who specialises in bridal hair and wedding hair styling. 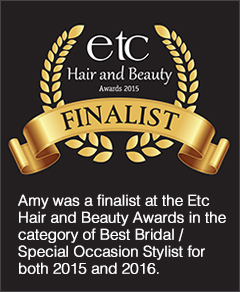 Amy has over 16 years experience as a fully qualified professional Hair Stylist with the ability and passion to create your perfect bridal hair style on your wedding day. With a free non-obligatory consultation, you will have the chance to discuss your ideas with Amy and work together to design a perfect style for you. Amy can cater for your entire bridal party including bridesmaids, mother of the bride and flower girls. You can feel reassured that Amy will be there to help you from the start through to the final minutes, to guarantee your wedding hair looks perfect for your special day. Amy is based in Tarring, Worthing. However, for a small fee she does offer the option to travel to your venue at locations across Sussex on your wedding day, so you can sit back, relax and enjoy the preparation. Amy travels to most places within the Sussex area including Worthing, Shoreham, Lancing, Portslade, Hove, Brighton, Littlehampton, Arundel and Chichester. Please see the Prices page for more information. 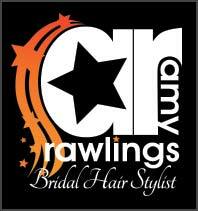 For inspiration take a look at the Gallery which shows some of Amy’s bridal hair styles for previous clients. If you would like Amy Rawlings to be a part of your special day and be your bridal hair stylist, contact her to arrange a free consultation to discuss the creation of your wedding hair masterpiece.